Ellis told me over the phone that he figures, since his car is a “Gen 1" 2010 model for which VW isn’t likely to find a fix, it’s destined for the junkyard anyway. So he thought he’d have a little fun, and impress his three and seven year-old daughters with a pink paint-job. 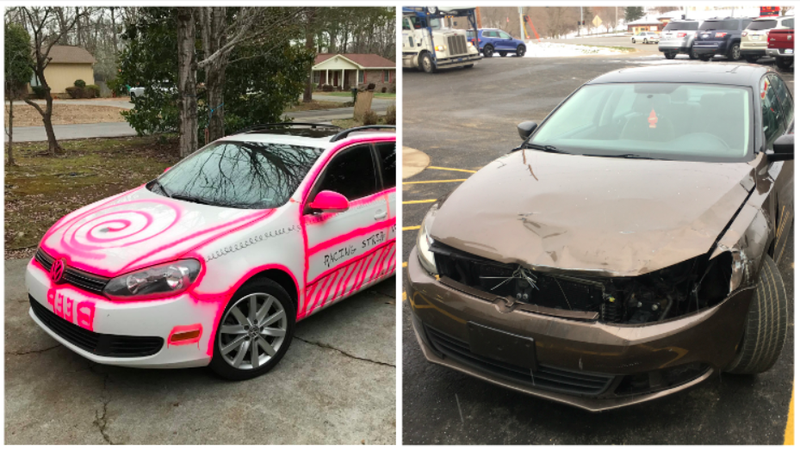 But while his girls love the Jetta Sportwagen’s new look, the buyback specialist at the dealer apparently did not, emailing her supervisor and telling Ellis he may have to repaint the vehicle. 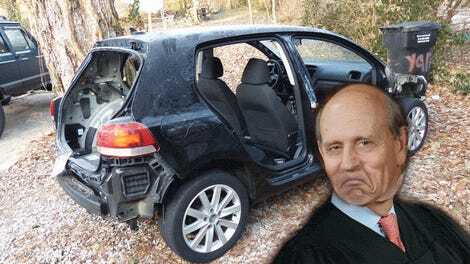 After the supervisor’s reply, Ellis said the claims specialist ultimately declared that the rattle-can job was considered vandalism, and that VW would not buy the car back in its current condition. Ellis says he then contacted one of the law firms handling the Dieselgate settlement, and their representative initially disagreed with the VW supervisor, but later changed her mind after VW’s counsel allegedly spoke with a committee of attorneys representing class members about this issue. There still hasn’t been a concrete decision on this one, so the fate of Ellis’s car is still in the air. Who knows, maybe Ellis can just fix the paint job with some sort of spray-paint removal compound? When there’s $13 grand on the line, I say it’s worth a shot. Then you’ve got reader Nate Boots, who—after swapping on parts from another Jetta—is turning in one of the shittiest, most pathetic vehicles I’ve ever seen. At least the two stripped cars I mentioned earlier looked like solid cars with some parts intentionally removed, and even the rattle-canned car above had a somewhat purposeful look, but this black and brown Jetta is just a sad, sad automotive soul, looking like it took a heavy fist to the face. I don’t even know where to start; there’s that crinkled and mismatched hood held down with zip ties, there’s also the scraped up and mismatched driver’s side fender and door, and the mismatched front bumper. Oh, and of course, half the damn front fascia is missing. And the interior’s sporting a pair of disgusting tan cloth seats that came off another wrecked Jetta. Also, there’s an engine cover on the passenger’s seat for some reason. The reason why Nate’s turning in such a junker, he told me over the phone, is because he bought a wrecked 2013 gas Jetta for cheap, and he plans to fix it up and flip it by swapping good parts over from his TDI. So, he snagged the driver’s door, fender, bumper, hood, AC condenser, radiator support, turn signal mirrors, wheel liners, heat controls, steering wheel with airbag, radio, headlights, and hinges, and bolted them to the wrecked car (he had to paint body parts from black to brown to match). He also took out the TDI’s leather seats, and swapped them with the crashed car’s nasty brown cloth ones you see above. Boots says he stands to make between three to four grand flipping that 50,000 mile wrecked Jetta that he brought back to life with help from his recalled TDI. Photo: Nate Boots. Here’s Nate in the process of swapping parts from his clean, nice TDI onto a wrecked 2013 gas Jetta. As much as I like driving TDIs, and as much as I’m rooting for VW to find a fix for the remaining 400,000+ cars so they can resell them, I’m not sure I’d want to buy one of these things after seeing the shenanigans from these crazy TDI owners.